With summer now just around the corner, colour is everywhere – from beautiful blue skies to green fields and multi-coloured flowers all around us. 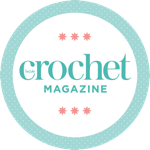 So this issue we’re celebrating colourful crochet, in everything from gradients to stripes to tapestry techniques. I’m definitely at my most comfortable in jeans and a t-shirt no matter what the time of year, so Sarah Shrimpton’s slouchy granny tee in a cotton/linen blend is currently top of my to-hook list. While my laceweight Lucy Scarf is just the thing for a pop of colour with a neutral outfit, and wonderfully light and airy for warmer weather. I’m a fairly recent convert to “corner-to-corner” crochet techniques, and I’ve been really impressed with how easy it is to build up a colourful piece of fabric. Rosina Northcott has used it to create a glorious rainbow baby blanket on page 66, and if you’ve never tried it out before, turn to her feature on page 24 for a great step-by-step guide. If you’re after other designs for little ones, make sure you check out Millie Masterton’s fun robot hat, and Annelies Baes’s lace top with fun contrast shoulders. This month also sees the end of our adorable Calendar Girls amigurumi series – these sweet dolls are just the thing for birthdays and other special occasions through the year, as well as making a great set to cheer you through the seasons.